JLDAP allows data to flow freely between your enterprise user data systems and JLMS Enterprise. This can allow automatic registration of users, synchronisation of user data, and when combined with JLogin, can dramatically reduce the administration overhead of user management. So when a new starter joins, they will automatically be added to the LMS. When the details of a learner change, such as name or job details, these are automatically updated in the LMS. When a learner leaves your organisation, their account is automatically deactivated. The only place you need to manage your learners is in your source user data system, such as your HR database. No need for double handling of data entry. When you combine this automated data flow with the flexibility of our Catalogue and Training Plan Rules system, the automation of course availability and course assignment becomes very powerful. Based on your organisational structure information, you can target specific content at groups of users and pre-load Training Plans with competancy based courses. These all synamically update when learners move within your business, so a learner always has the relevant training programmes available to them for the role they currently hold. 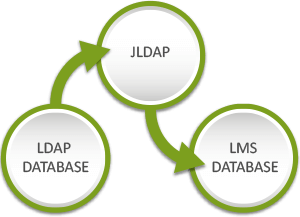 The JLDAP software allows data to freely flow between your enterprise user data systems and the LMS. This can allow automatic registration of users, synchronization of user data, and when combined with JLogin, can dramatically reduce administration of users down to a trivial task. So by either providing a data export from your user data system or by a direct LDAP connection into that data system, your user data management within the LMS will be next to nothing.